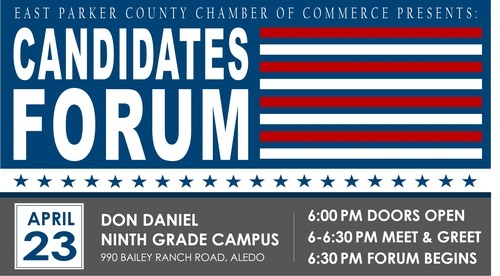 The East Parker County Chamber Governmental Affairs committee will be hosting a candidates forum for the contested races in Aledo, Annetta and Willow Park. The public is encouraged to attend. The candidates will be ask predetermined questions and questions will not be asked from the floor. There will be a meet and greet from 6-6:30PM.